The newest Painting of the Week is Sutter's Fort. This art, featuring the one of the corner towers, shows one of my favorite places to visit. You are transported back in this dusty room to a time where you may have had to defend the fort against attackers on the frontier. I also added a covered wagon to show how you might have arrived after your long journey from the East. 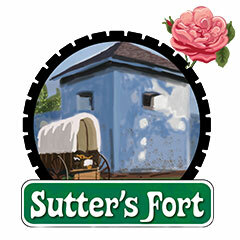 Click here to visit the Sutter's Fort Page.